Before today, I had never seen a Cushman like this up close. But, fortunately, on a walk this morning with my dog, just down the street from my apartment, there was this wonderful box situated along the curb. I love it. I need it. There’s confusingly two companies operating as Cushman, and I don’t even want to get into the differences because I simply want to focus on the van I laid eyes on. Cushman The White Van. Starts runs and operates good. Air Conditioning is cold. Radio. It is governor to limit speed to 25 mph with three -speed stick shift. There is no title. Email with questions. Located in NE Ohio. Buyer to pick up. That’s what puzzles me. How’d the White Van find me in Brooklyn? Indeed, my new van lets the world know it’s prohibited for use on public roads. The IIHS explains that so-called low-speed vehicles can have a top speed of 20-25 mph, and are intended for “short trips for shopping, social, and recreational purposes primarily within retirement or other planned communities with golf courses.” Most places you can’t let them go above 25 mph. Perhaps I have a neighbor who just enjoys the luxury of such a compact ride. But that’s besides the point. As this one posting tells it, the Cushman here probably runs Good. It starts. How capable is the Cushman White Van? 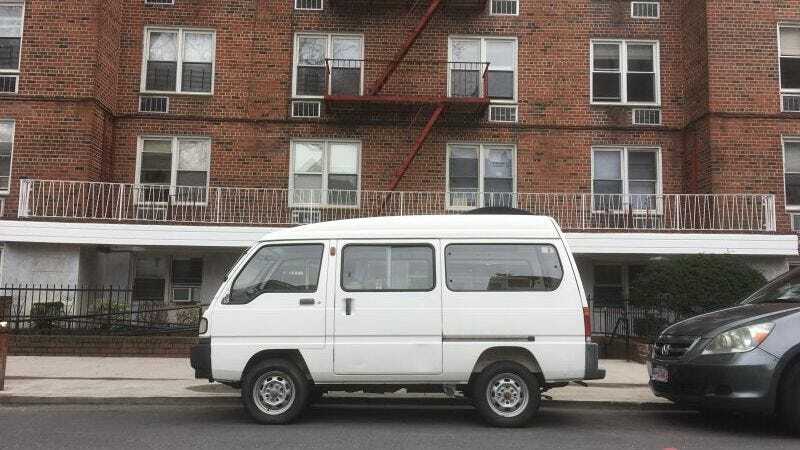 One owner—who described it as “very interesting” and “very cool”—posted the van’s apparent specs on a forum back in 2011. Standard features include a front bumper, a grille, dome lights (front and rear). It seats up to eight(???). The four cylinder engine pushes out 49 hp. There’s 58.6 lb ft of torque at 3500 rpm. It maxes out at 22 mph. In a different life, I’d live in a quiet town, maybe near a body of water, where the speed limits are capped at, say, 25 mph. Every day, I’d drive to the one store nearby in my Cushman, which is perfect in this scenario, because it can’t shift out of 3rd gear anyway. And I’d clutch the massive steering wheel that must’ve been designed for a big-rig at one point, but I don’t care how or why it ended up here. I’m only using it for short jaunts as it is. But I live in New York City, where driving is hell, and surely that’d be no different in a Cushman. And so maybe I should leave it behind.